Up to 5 percent of the population has or will develop a brain aneurysm, or a weak area in a blood vessel that usually enlarges, according to the American Heart Association. While most do not produce symptoms, up to 3 percent bleed, which can lead to severe brain damage or death if left untreated. In addition to medical treatments, such as drugs and surgery, a healthy diet can help ensure strong recovery and lower your risk for recurrence. Once an aneurysm has ruptured and you've received treatment, you may stay in the hospital for as long as a month for monitoring and recovery. If you've had surgery, you may need to stick to a liquid diet until you can easily eat and tolerate solid foods. A full liquid diet consist of liquids and foods that liquefy at room temperature, such as broth, strained soups, gelatin, pudding, milkshakes, juices, pudding and ice pops. Getting enough calories and nutrients is important for energy and healing, so although foods such as milkshakes are typically high in fat and calories, your doctor may recommend them. Having one aneurysm increases your likelihood of experiencing another, and eating plenty of fruits and vegetables may help prevent aneurysms from bleeding, according to Fletcher Allen Health. 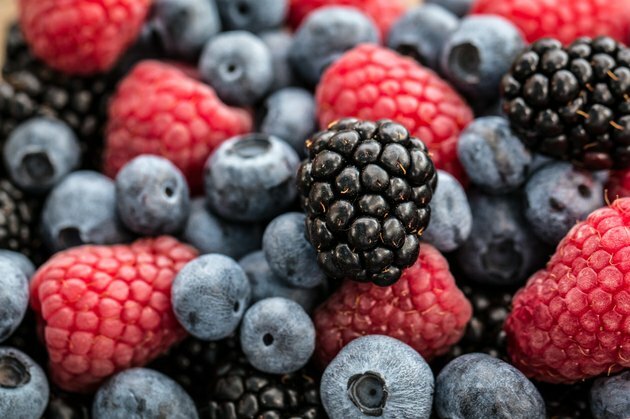 As rich antioxidant sources, fruits and vegetables enhance overall brain function and protect against cognitive decline. Colorful foods, such as berries, citrus fruits, carrots, dark leafy greens and tomatoes, are particularly rich in antioxidants. Lowering high blood pressure and maintaining arterial health could help keep an existing aneurysm from rupturing, and guard against certain types of aneurysms, says the University Maryland Medical Center. Rich in fiber and antioxidants, whole grains promote these factors. They also provide rich amounts of carbohydrates -- your body and brain's primary fuel. While simple carb sources, such as white bread and sweets, provide the quickest-acting energy, they tend to lack fiber, antioxidants and other brain-healthy nutrients. For longer-lasting energy and bolstered wellness, choose whole grains, such as oats, brown rice, quinoa, air-popped popcorn and barley, more often. Fatty fish, such as salmon, mackerel and herring, and flaxseeds are top sources of omega-3 fatty acids -- anti-inflammatory fats that play a vital role in brain function. A lack of omega-3s can cause poor memory and depression, and hinder circulation, says the UMMC, all of which can make your recovery after an aneurysm more difficult. To minimize inflammation and increase overall wellness, replace fatty meats -- such as steak, organ meats and fried chicken -- with grilled, baked or poached fish. For plant-based omega-3s, add ground flaxseeds to yogurt, smoothies or cereal. Are There Foods Good for a Concussion?